The basic characteristics of the family Mysidae hold true for Hemimysis anomala G. O. Sars, 1907. 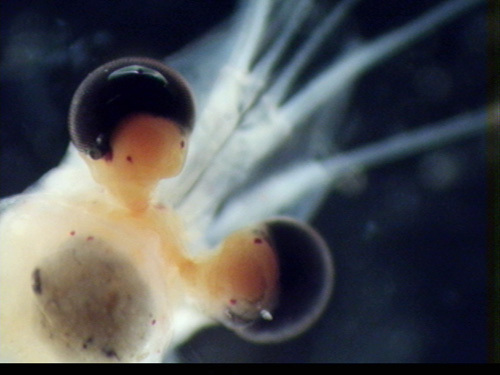 Opossum shrimp possess a transparent body and large compound eyes (Figure 2) (Balcer et al. 1984). 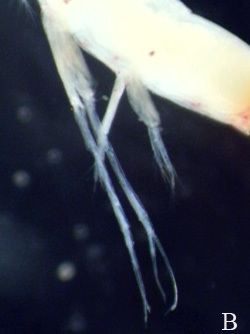 The Mysids as a whole are rather large for zooplankton with a size range between 6-13 mm (USGS). Females have a brood pouch for young composed of plates on the final two thoracic segments (Balcer et al. 1984). This trait is often used to identify adult females (Borcherding et al. 2006). Males can also be distinguished by their enlarged, biramous IV pleopod (Figure 3 and Figure 4) that is used during copulation (Pothoven et al. 2007). Females are usually more common than males. In one study the, only month where males outnumbered females was April (Borcherding et al. 2006). Figure 3. Male H. anomala with enlarged IV pelopods visible. 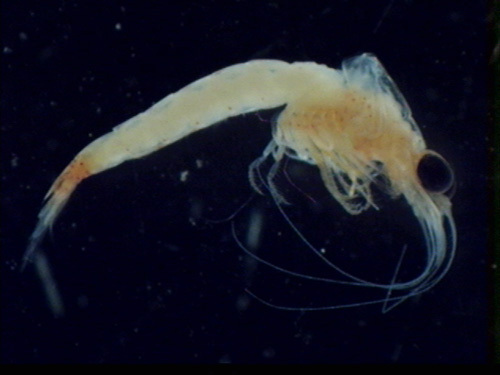 Perhaps the species most easily confused with H. anomala is the native opossum shrimp, Mysis relicta. The best characteristic for distinguishing these two species is the shape of the terminal end of the telson. The telson is a plate-like feature that is located on the tail. In M. relicta the posterior end of the telson is shaped like a V and has no spines (USGS, Pothoven et al. 2006). H. anomala has a telson that has a flat terminal end and two long spines at each corner (Figure 5) (Pothoven et al. 2007). Even when preserved the differences in tail structure remain visible. The tail also features two prominent white spots. Figure 5. The telson of H. anomala helps to distinguish it from M. relicta. It has a flattened posterior end with two large spines. Another unique feature of H. anomala are its chromatophores (Figure 6). 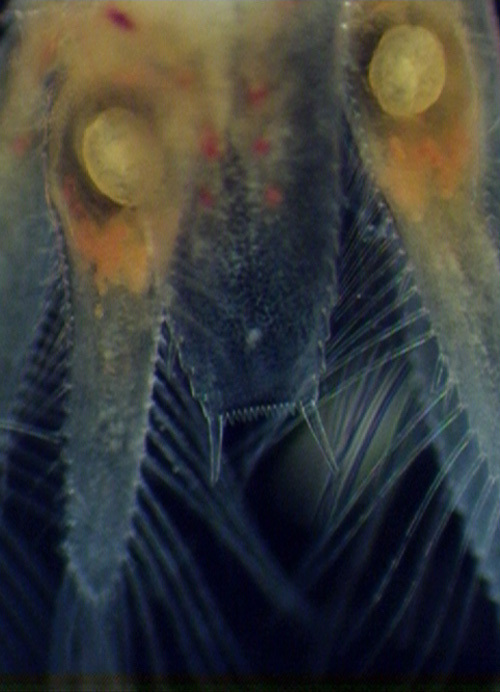 The common name bloody-red shrimp comes from these chromatophores. These tend to expand during the day making these individuals appear red. In turn, this helps them hide from fish predators during daylight (Pothoven et al. 2007). Figure 6. 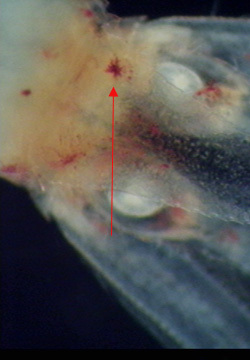 Chromatophores of H. anomala are the reason it is named the bloody-red shrimp. Figure 1. H. anomala female preserved in formalin. Figure 2. The compound eyes of a H. anomala specimen. Figure 4. (A) IV pleopod of a female H. anomala. (B) IV (left) and V pleopods of a male H. anomala. H. anomala is native to the Ponto-Caspian area including the Caspian, Azov and Black seas. Prior to the increased human activity associated with the modern era, H. anomala was known to have moved only 40-60 km from its native range (Borcherding et al. 2006). With the advent of modern shipping, this species has expanded its range throughout Europe and now into the Great Lakes (Audzijonyte et al. 2008, Borcherding et al. 2006). Like many other Ponto-Caspian invaders, H. anomala was thought to have originally arrived in the Great Lakes via ballast water. In 2006, they were found in Lake Michigan near Muskegon (Pothoven et al. 2007) as well as in Lakes Ontario and Erie (Audzijonyte et al. 2008). Currently they have been found in all the Great Lakes except Lake Superior. It is thought that this species has the potential to invade inland lakes (USGS). Within lakes, rocky or craggy substrate provides ideal habitat for H. anomala. In daylight this species will migrate into deeper waters to avoid fish predation. A typical depth to find this species is between 6-10 meters (Borcherding et al. 2006, USGS) although they have been found at depths greater than 50 meters (USGS). Docks or shade from boats also provide places of refuge during the day. These swarms are sometimes highly visible and should be reported. If you see a swarm please report it. Information on reporting a swarm can be found at NOAA’s website. H. anomala returns to the surface at night to feed (Borcherding et al. 2006). Preferred temperature range for this species is 9-20ºC (Pothoven et al. 2007) although they have been known to survive 0ºC temperatures which means that a population can overwinter in the Great Lakes (Borcherding et al. 2006). Two feeding methods are known for H. anomala. The first method involves the use of thoracic limbs (Figure 6) to capture and bring prey to the mouth. 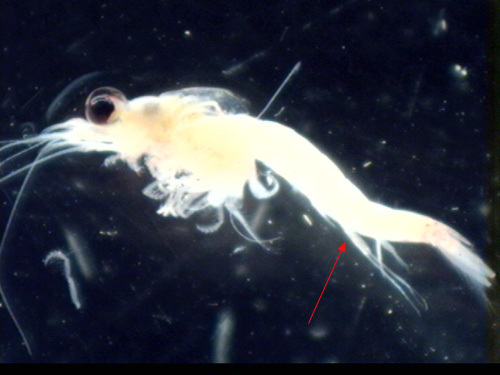 This method is used to capture the main prey of the adults which are a variety of zooplankton including copepods, cladocerans and various rotifers (Borcherding et al. 2006). The Borcherding et al. 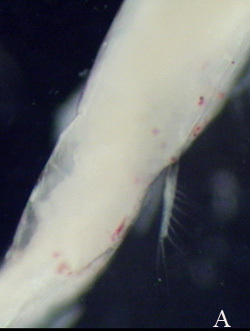 study found that zooplankton that are consumed are usually the most dominant group at that time (2006). The second known feeding method is, basically, the H. anomala individual cleaning itself off (USGS). This method is preferred by juveniles whose diet is composed of less zooplankton and more phytoplankton (Borcherding et al. 2006). Green algae and diatoms were the predominant phytoplankton found in juvenile stomach contents (Borcherding et al. 2006). Another food that this species consumes is detritus. Adults are also occasionally cannibalistic. This may explain why juveniles tend to stratify and stay separate from the adults in the water column (Pothoven et al. 2007). Typical lifespan of H. anomala is approximately 9 months (NOAA). Sexual maturity is achieved after 45 days. Adult size ranges from 8-11 mm in length (Borcherding et al. 2006). Females will grow to be on the higher end of this size range while males are usually smaller. Mating begins in the spring when water temperatures reach 8-9ºC. Males will grasp the females with their enlarged, biramous IV pleopod for fertilization. Females will brood their neonates in a special pouch called a marsupium (Pothoven et al. 2007). The marsupium is composed of the last two thoracic segments (Balcer et al. 1984). Females have been found carrying 14-66 eggs although, in Lake Michigan, brood size ranged between 2-17 with larger females producing higher numbers of eggs (Pothoven et al. 2006). Reproduction can occur continuously through the summer with 2-4 broods being produced (Pothoven et al. 2007, USGS). Audzijonyte, A., K. J. Whittmann and R. Vainola. 2008. Tracing the recent invasions of the Ponto-Caspian Mysid shrimp Hemimysis anomala across Europe and to North America with mitochondrial DNA. Diversity and Distribution 14: 179-186. Balcer, M. D., N. L. Korda and S. I. Dodson. 1984. Zooplankton of the Great Lakes: A Guide to the Identification and Ecology of the Common Crustacean Species. The University of Wisconsin Press: Madison, Wisconsin. Borcherding, J., S. Murawski and H. Arndt. 2006. Population ecology, vertical migration and feeding of the Ponto-Caspian invader Hemimysis anomala in a gravel-pit lake connected to the Rhine River. "Great Lake's Invader: Bloody Red Shrimp (Hemimysis anomala)". NOAA. 10/15/2008 <http://www.glerl.noaa.gov/pubs/photogallery/Hemimysis.html>. "Hemimysis anomala". USGS. 10/15/2008 <http://nas.er.usgs.gov/queries/FactSheet.asp?speciesID=2627>. Pothoven, S. A., I. A. Grigorovich, G. L. Fahnenstiel and M. D. Balcer. 2007. Introduction of the Ponto-Caspian bloody-red Mysid Hemimysis anomala into the Lake Michigan Basin. Journal of Great Lakes Research 33: 285-292.